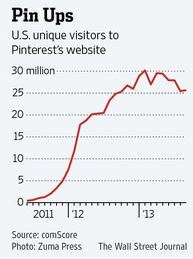 Great article in the WSJ about Pinterest, visitors, and sales. Very interesting implications: Pinterest could be a very lucrative site to advertise for retailers, as their monetization strategy ramps-up. However, the scale may be much smaller than Facebook and Twitter, and growth may be leveling-off.